The original 2000 release has been streamlined and remastered to deliver a straight-up Hip-hop album full of catchy hooks and plenty of Rap time. Includes 5 new tracks and gives a glimpse into the KJ of old. 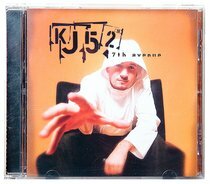 About "7th Avenue 2004 Edition"
:The original 2000 release has been streamlined and remastered to deliver a straight-up Hip-hop album full of catchy hooks and plenty of Rap time. Includes 5 new tracks and gives a glimpse into the KJ of old.